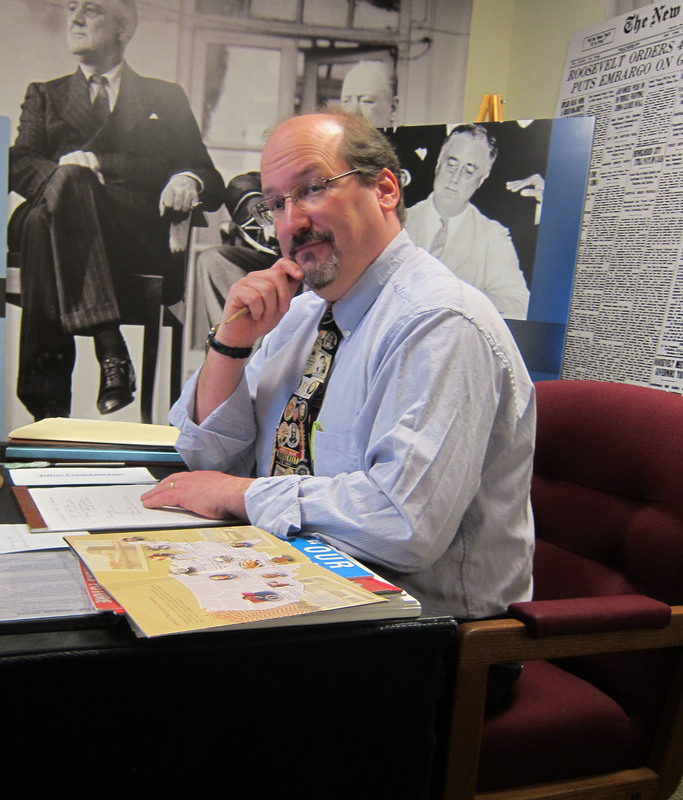 I joined the staff of the Roosevelt Presidential Library and Museum as the Education Specialist in April 2001. At the time I was still under contract as an Instructor of Government and American History with Dutchess Community College. As soon as the semester ended in the early part of May, I began my full-time Education Specialist responsibilities and was shocked to find myself starting my new position just at the very peak of the school fieldtrip season! With the help of two seasoned volunteers, Joe Gleeson and Bob Richardson, and with the support and guidance of Lynn Bassanese, who had been running the education department until I was fully on board, I assumed the burden of teaching the students of today about the world of the Roosevelts’ in the 1930s and 40s. My biggest concern was, how was I going to make a president who lived in a time before television, computers, and the widespread use of air conditioning, pertinent to the net-connected (addicted?) young learners of the 21 first century? Sadly, it was not long before events would answer the question for me. The surprise attacks on New York and Washington on September 11th 2001 stood in direct parallel to the surprise attack on December 7, 1941 at Pearl Harbor. Concerns over WMD’s -weapons of mass destruction- had direct tiebacks to the Manhattan Project and the development of the Atomic Bomb. In November 2008, the United States broke a significant racial barrier and elected our nations’ first African American President, this just sixty-seven years after the racially tainted internment of Japanese Americans. As economic conditions went from bad to worse I was probably one of the only people in America who welcomed the “Great Recession” for its wealth of teachable moments which make the teaching of the Great Depression so much easier. To my astonishment, my biggest concern turned out to be my biggest lesson, and it’s the lesson that my staff and I try to instill in the more than 15,000 students who visit our site each year: that so many of the issues and concerns faced in the Roosevelt era are still with us today. And that as we press to move forward, we must pause to look back at the lives and legacies of an extraordinary President and First Lady, who left us with so many rich and valuable lessons from which we all can learn. Good grief — more biographical material about the FDR Library staff but still little-to-no information from the staff about what made and makes FDR such an important president. Isn’t it your charge and responsibility to inform the public about FDR? If not, why are you there? I’m sure Jeff Urbin is a very nice person but I simply do not care; I come to this website to learn about FDR, not about the staff whose jobs exist because of what FDR did for this country. Chris, thank you for following our blog. We hope you will also visit our Library’s website: http://www.fdrlibrary.marist.edu to find extensive information about the Roosevelt presidency, the Library’s unique historical collections, as well as our museum exhibitions, public programs and educational activities. Yes, I do look around the FDR Library website and — as I have noted in another post on this webpage — no staffer has bothered to update the “This Week in Roosevelt History” page since the week of: October 1-7. Does no one on the staff know anything FDR did during any other week of the year? It might be time for the staff at the FDR Library to read the MAGIC messages; FDR did. FDR sacrificed his health and his life to the effort to win not only World War II but to “win” the peace by providing for a better and fairer world once there was peace. And, because of his thoughtful and creative planning, we all lived in a better world after WWII than most of us had known prior to WWII. The MAGIC messages were intercepted and decoded Japanese DIPLOMATIC service (NOT military) messages describing the Japanese government’s successful efforts in recruiting first- and second-generation Japanese-Americans living along the West Coast of America to provide data on troop, ship, and military materials movements. We have already established contacts with absolutely reliable Japanese in the San Pedro and San Diego area, who will keep a close watch on all shipments of airplanes and other war materials, and report the amounts and destinations of such shipments. The decoded MAGIC message remained a secret until their release in 1977. Telling young people of today about FDR and his great achievements should be a joy, not a problem for the FDR Library staff. My name is EJ, a freelance writer in South Korea. I’m preparing a book about Harvard and American universities’ history. I want to use President Roosevelt signing in G.I. Bill of right in 1944. I believe it was the most significant moment in higher education. To use this photo, what do I need to do?